During his recent historic visit to Cuba, President Barack Obama, First Lady Michelle and their two daughters (and a security gaggle) surprised a Havana restaurant owner by dropping in unannounced for some authentic Cuban food. Good, comforting cuisine was on the President’s mind, and there was also an attention to detail with his choice of wine. 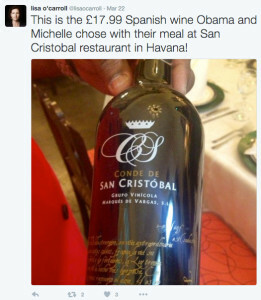 The restaurant’s name, San Cristobal Parador, struck a chord with the Commander in Chief, who ordered up a bottle of something similarly named: Conde de San Cristóbal from Ribera del Duero. According to The Guardian journalist Lisa O’Carroll’s reporting, chef Mario-Calzado Frias whipped up his specialty dish of filet mignon for the President, paired with three sauces: mushroom, pepper and San Rafael sauce. Meanwhile, the First Lady dined on the “‘Havana Temptation,’ a beef with banana dish.” The two Obama daughters decided on pork entrees to round out the evening, and while the youngest two Obamas likely didn’t partake in the Conde de San Cristóbal, it’s a safe bet that it paired beautifully with the two beef dishes. The President isn’t the only one with some affection for this Ribera del Duero wine. Earning 90 points in Wine Spectator, critic Tom Matthews described the Conde de San Cristóbal with this kind review: “Lively acidity drives bright flavors of blackberry, licorice, tar and smoke in this focused, energetic red. Light, firm tannins lend backbone, while citrus and smoke details linger,” he raved. Upon hearing the news, Conde de San Cristóbal told us that “Obama’s visit to Cuba has also been historic for us. It was a surprise when we heard about the private dinner,” saying that the Presidential tasting “has had an incredible impact” on their profile. And, to make things even sweeter, “the restaurant informed us that Michelle Obama loved our wine,” they said. Get more info on Conde de San Cristobal here, and click below to order yourself a bottle fit for a President. And the President wasn’t done there. During a diplomatic dinner with Cuban President Raul Castro, their Cuban dish of roast pork with plantains was met with a wine pairing for the ages. The two Presidents enjoyed a bottle of the infamous Vega-Sicilia Unico — perhaps the most cherished and sought-after wine in all of Spain. It’s good to be the President. A bright deep dark cherry coloured wine with violet tints. The nose is lifted and very expressive. Ripe blackberry, fresh blackcurrants enriched with ripe red berries and soft touch of floral scent & red earth. On the palate generous fruit flavours, silky tannin structure and fresh finish. It offers exotic spice and a mineral, earthy edge that develops in a complex, very elegant and lingering aftertaste. Undoubtedly wine that surprises.